Contact us for the best price on a brand new hot tub factory direct. 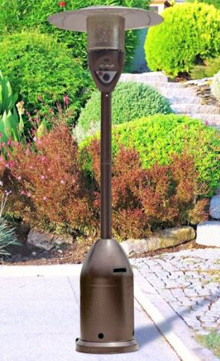 This month's item is this #1 selling Patio Heater ideal for the spring. If budget is your primary concern, these hot tub price categories should help you narrow down the type of spa to look for. Spas in the Budget range will have simpler controls, less jets and pumps, and less toys and features. If they are made from quality acrylic, then the longevity will be just as good as a luxury tub. To lounge or not to lounge - that is the question! A lounger is preferred among first time spa buyers, but repeat spa buyers tend to go for the non-lounger as they have more seating room. This is strictly a matter of personal taste as you will find lounger and non-lounger models with exactly the same exterior dimensions. Read about the latest hot tub news. Learn about hot tub safety and hear from spa owners about their experiences.